The LEC raised the annual dues from $15 to $20, but please read on about some incentives that are being offered for the upcoming year to encourage early dues payment. Because of the fire that destroyed Rancho Alegre, the Lodge has incurred some significant costs for Ordeals and functions that it previously did not have. Major meals are being catered and smaller meals are being purchased locally. Before the Lodge used the Rancho Alegre kitchen staff who used their bulk ordering and discounts for Outdoor School. In addition to this, the Ranch still does not have potable water or gas (propane gas has been restored as of October) for cooking. Also, our membership numbers have dropped. Also, it has been quite a few years since the Lodge raised its dues. Now for the incentives: First, anyone paying their dues before December 31, 2018, will only pay $15. Only those delaying payment until January or February or later will then pay $20 for 2019 dues. Second, in 2017, we allowed anyone who wanted one additional dues patch to pay $10 for that patch. Thus, if you want the second patch for another uniform, trading, or your collection, you can do so. However, the order and payment for the second patch must accompany your 2019 dues form and payment no later than December 31st. Our Saturday Banquet was another outstanding success. The event was catered by Country Meat Market of Goleta. The owner, Steve Gully, was an Arrowman in his youth. He gave us a fantastic meal and at a very reasonable cost. Our Spring Ordeal, which was another outstanding feast was prepared by members of the Knights of Columbus, Goleta Valley Council 5300, under the direction of Jim Bradbury who used to be the UPS Driver serving Rancho Alegre. There was a total of 67 registered attendees. The service performed included removal of a lot of burnt tree and shrubbery. This was necessary for certain County of Santa Barbara imposed restrictions before construction permits would be issued. A number of signs were painted and trails were cleared. Thank you to all who helped make the future of Rancho Alegre a reality. We want to thank Dr. Sage Hider for the donation of a propane grill for the Lodge and the Ranch. This grill will be useful for future activities, especially while we are in construction and don't have full utilities. Each Chapter will be electing their new Chapter Officers at their next meeting. Chapter Officers include a Chapter Chief, Chapter Vice Chief, and a Chapter Recorder. The Chapter Officers will be installed in their positions on Saturday, November 17th, along with the Lodge Officers at the Annual Banquet. At the Banquet, awards and certificates are given out. Earlier in the day will be the Lodge Leadership Development which is open to ALL Arrowmen. Put the afternoon and evening of Saturday, November 17th on your calendar. More information will be sent out in the next issue of the Bear Claw. Also, the Section Conclave will be September 21-23 at Camp 3 Falls in Frazier Park. New Arrowmen (within the last 12 months) receive a reduced rate. This is always a fantastic event! To register, the link is http://sectionw4n.org/conclave/. There is training, games, fellowship, and plenty of activities. At this Conclave, the National Chief will be present. For more information contact Lodge Chief Joey Kamlet at joey77k@gmail.com. Car pooling is encouraged if that is a concern. National has issued a new ceremony for Arrow of Light Ceremonies. This becomes effective January 1, 2019. No other ceremony may be used. In addition, there will be absolutely NO use of Indian regalia, etc. in the ceremony. Information will be issued to the Packs regarding this change. Also with the revised Cub Scout advancement program, Webelos should be bridging in February or March so that they have sufficient interaction with their unit and its leaders prior to Summer Camp. This earlier date creates scheduling problems when unit elections are left to the last month (March). Chapters should begin Unit elections for 2019 beginning on November 1st and they should be completed by March 30th. Len Kamlett will be issuing new forms and instructions prior to that date. Older forms will not be accepted. Easter next year is April 21st which is quite late. Traditionally, when this happens the Spring Ordeal has a lighter attendance, particularly in Districts that have May Camporees and call-outs. We are asking each Chapter Adviser to notify Wayne Rascati at Chumash90@cox.net of the date and location of your District's Camporee. Adult nominations are due no later than March 31st in order to be considered by the Supreme Chief of the Fire and the committee that he appoints to review and approve the nominee. The scheduled date for the Spring 2019 Ordeal is the third weekend of May - May 17-19 at Rancho Alegre.. Here is what one Northeast Region did to record their 2015 NOAC trip. 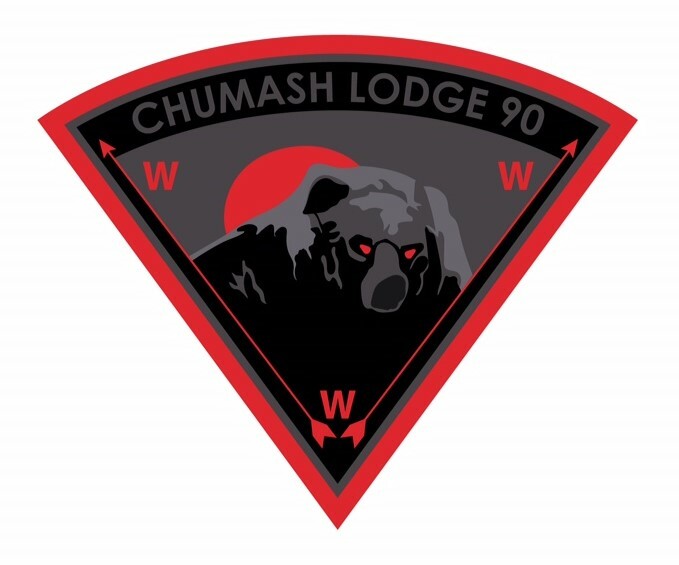 A possible project for Chumash Lodge to do for the next NOAC. Any adult or Scout age 18 or over must have BSA's Youth Protection Training under recently revised guidelines. Please go online to www.my.scouting.org and complete the appropriate Youth Protection Training course. Please print out a copy of your completion certificate at the conclusion of the online training. Individuals 18 or over not having proof of a valid completion of this course during the previous 24 months will need to attend a training class on Saturday morning during the Ordeal. Western Region has adopted a policy that Youth Protection Training is now an annual requirement.